Gem of the Day: IN THE NAME OF THE FATHER GOD WE HAVE HAD A DOWNRIGHT MIRACLE DOWN IN FLORIDA! This picture was taken last night! 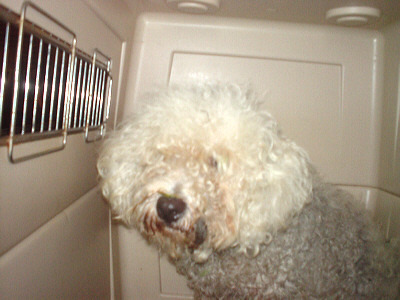 Our lost Little Orphan Annie is now safe and alive and in custody, in Florida! She was still wearing her SPR vet tags! A miracle of the Lord God Himself has happened tonight! Little Orphan Annie, the precious, lost Small Paws Rescue puppy mill bichon, who was reportedly seen being killed and eaten by an alligator in Florida, has been found after 4 months of running from panthers, bobcats, alligators and car traffic, and she is 100% safe, sound, alive and in the custody of rescuers tonight!! Hallelujah AND THANK YOU JESUS!! Are you still with me?! Are you breathing?! Breathe! And then you better grab onto something! You will remember back in February, one of our little puppy mill rescues got away in Florida, still dragging her little pink leash, collar, and the veterinary tags of Small Pawser Vicki Nixon’s vet, from near Detroit Michigan, where little Annie had been vetted by Small Paws. Annie was lost in a neighborhood, surrounded by canals that were filled with alligators, and she would not come to anyone. She was just terrified of people. We invested much time, money and prayer in trying to recover this precious little one, who seemed so very illusive. We had something like 70 sightings of Annie, but were still unable to catch or trap her. If you want to take a trip down memory lane (Or more like nightmare alley in some cases!) scroll down to the bottom of this newsletter, to see the trail of emails that we sent out in February and March about the extensive search for this little girl! Vicki Nixon flew down for a week. I flew down for 2 1/2 weeks. No stone was left unturned. 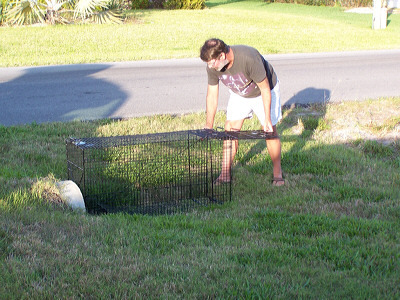 The Florida fish and Wildlife Department, for the first time ever, assisted in the recovery of a lost domestic animal. with her dart gun as we hoped against hope to drug Annie into being captured. This woman and I trudged through backwoods and backyards, in pitch blackness, hot on the trail of this one little white dog. I will never forget my time spent with Laurie Caron who told me that Annie was the hardest thing she had ever tried to trap. 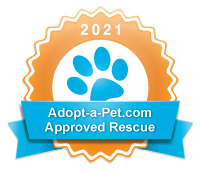 We even contacted the US Military, through one of our Small Pawsers in special opps, in hopes of receiving a special security clearance to be able to use one of their new GPS recovery programs. Unfortunately, it was going to take 6 weeks. We set live humane traps. We set more traps. We set BIG traps! This one was a trap built for trapping wild boars that destroy farms. We drugged dog food. We drugged fried chicken. Sheesh! I SNAGGED her back foot with a pitch net the first night I was there! The Tulsa Sheriff’s Department even loaned us their only net gun, and got clearance for me to travel with firearms, to Florida. 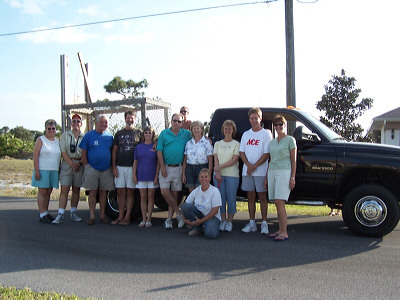 We formed many lasting friendships with other rescuers, during this search. We formed friendships between retired neighbors, who didn’t know each other before, but do now. They now golf together and go to dinner regularly because the search for Annie brought them together! This little girl brought many people together. The saddest day was when we heard that a group of construction workers witnessed the unthinkable. They told us that an alligator had caught a small white object, dragged it down. drowned it and eaten it. One of them said it was a small white dog. Praise God in the morning. Our God is bigger than any alligator or anything that anyone there may have thought they saw. Tonight, “NEVER GIVE UP Katie Wagoner”, of EARS animal rescue in Englewood Florida called me! We worked so closely together during my time in Florida. No one worked harder on trying to find Annie than Katie did! EARS went to work setting up the EXTRA LARGE live humane trap that we had purchased when I was down there. I left it with Katie, just in case. They put a tarp around it to make it blend in with the brush. They asked neighbors not to tell anyone about what or who they were trying to trap. They didn’t even want to tell us in case it wasn’t Annie, or in case, God forbid, she got away again or worse. They didn’t want to put us all through that all again. For the first few days, they put food in the trap but didn’t set it. Annie would walk all the way in it to get the food, then push the food to the back of the trap, eat it, and then walk right out again pretty as you please. The trap gained her trust. Tonight, she did the exact same thing. She returned to the trap at 8:15 PM as she had for the last few nights. The little booger IS a creature of habit. I can attest to that. Tonight, again, just as she had done before, she went INTO the trap after the food, pushed it to the back of the cage and WHOMP! The trap door came down and they got her at 8:30 P.M. tonight, thank you Jesus! She is being taken to the vet at 8:00 in the morning. I’m thinking she will have to probably be put under, to be shaved down. From all appearances she looks pretty healthy! We will have a heartworm test done and bloodwork, just to make sure! Dadgummit! She is a walking little miracle, as are her rescuers! I know one thing! I know, that I know, that I know, that God has had His hand on this little girl for the past four months. There is no other explanation for her miraculous survival! If you could have seen the terrain that I saw! This place was crawling with alligators, 30 pound Bobcats, and Florida black panthers. I am hoping to be able to fly down to Florida this week to BRING ANNIE ON HOME! I’ll bring her back with me in the cabin (strapped to my body twenty times over, encased in a glass bubble, with a wire cage around us both, with GPS collars around each of her feet and both of my ankles) where she will be fostered back here in Tulsa, by Bonnie Ferguson, our Executive Assistant. Bonnie has fostered many puppy mill rescues with severe “puppy millitus”. It will take time and patience to rehab this little girl back into society, and to teach her that people are not going to hurt her and that we love her with all of our hearts! Katie also told me tonight that this coming week is her last week on staff with EARS. Her three teenagers are needing their Mom and so she is going to be staying home with them. Katie said that this has been a wonderful gift, finding Annie, on her last week there with EARS. Aww Katie! We love you and we thank you so so much for your determination! Now, I think you all will agree. I would like to be able to make a donation of gratitude to EARS for this tremendous, successful recovery of our baby Annie! I’d like to send them $500.00 for all of the trouble they have gone too, taking even more time away from their own rescue group! One more thing! If any of you have enough airlines miles where you could get a round trip domestic ticket so that I could fly from Tulsa, Oklahoma into either Sarasota, Florida or Tampa, Florida, maybe Wednesday or Thursday, and you would like to donate them for me to be able to go and bring Annie back home, please let me know in e-mail. Thank you in advance! Always remember. God loves you more than anyone else ever has, and more than anyone else ever will. YOU are the apple of His eye! He knew you and loved you before he knitted you together in your mother’s womb. All the days ordained for you were written in His book, before one of them came to be. YOU are VERY special to God! Yes YOU! When I first saw this beautiful picture of Cheri Sisco’s “Humphrey&qusot;, I thought it was truly the epitome of what we do, and why we do it. 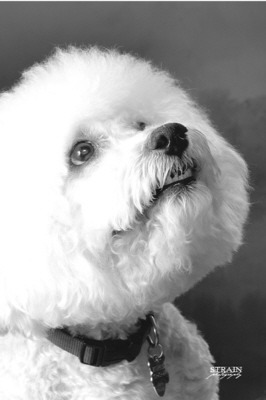 I wanted to use this black and white picture of Humphrey, taken only days before his death due to congestive heart failure, to let those who may be new to Small Paws, know what we do and why we do it. Without Small Paws, Humphrey would have never known love. He would have died in a kill shelter, sick and alone. Because of Small Paws, and Cheri Sisco, he lived, he loved, and he smiled.